We had a good start and footed off to the south side of English Bay, then headed back to the Bowen Island side of the course, short tacking the beach until near Schehelt when we attempted to head over to the Ballenas Island mark. The winds were extremely light and the rest of the crowd stayed on the beach and ran all the way up to Texada, leaving us stranded in the middle. After a 12+ hour first leg we rounded Ballenas behind most of the long course boats and half of the medium course boats -- a real outhouse moment. On the first downwind run from Ballenas we hoisted our trusty A1 and worked down the beach steadily passing boats. We managed to squeeze off Wasabi by the Entrance Island rounding with only our friends on Neptunes Car in front. 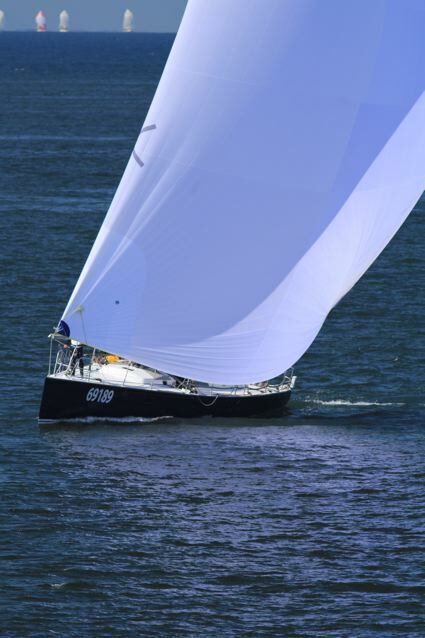 Wasabi is very fast downwind and she will be a force to deal with this season. After rounding Entrance we hoisted out A0 and had a very fast reach over to Halibut Bank. The Car sagged down on this leg and we were able to get to the mark about 5 minutes ahead with Wasabi within sight behind. After Halibut Bank we put up the 3Di J2 and aimed right at Ballenas. About 2/3s of the way there the wind shifted so we headed to the Vancouver Island side. The Car followed us but Wasabi went right losing a great deal of time. We rounded Ballenas for the second time that night with the Car behind but still in touch. After rounding we put up the A1 again and headed back to Entrance trying to stay between the mark and the Car. The Car took an interesting inside route which looked like it might pay off until they hit a dead zone near Naniamo with what looked to be adverse current. By the time we rounded Entrance for the second time we were comfortably ahead and out of touch with the rest of the fleet. We again hoisted our A0, but this time with our GS for some extra power. We headed right for Bowen Island and powered through the other divisions on our way to the finish. Just before Bowen Island we switched to our A2 and while staying out of the current finished after 25 hours and 24 minutes of racing. While the final results are not in, it looks like we corrected to about 54:28 ahead of the Car and 1:04:52 ahead of Wasabi taking first place. These are fine boats and we were delighted things worked out that way, although to be honest there were moments when we wondered if we had enough food on board to even finish!